As tempting as it may be sometimes, you’re not allowed to leave people stranded in your pool. There are laws against that. Swimmers need a way to get out of the water, so you need a ladder at least, if not actual steps, and you have to include them in your design from the beginning. 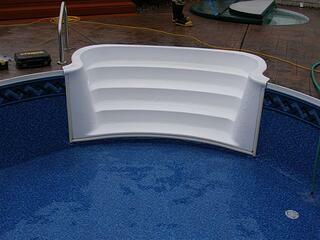 White plastic steps are the standard for vinyl liner pools. 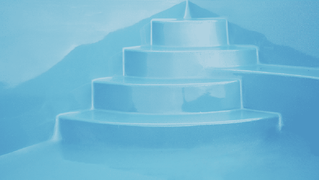 For me, and probably for most people, they’re the type of steps you expect to see in these pools. They’re made of polymer and are attached to the pool walls. These steps are affordable. They’re the option that comes with most vinyl liner pools, after all. They’re pretty durable too. It’s solid plastic/polymer, with no liner over it, so you don’t have to worry about tears or punctures. They aren’t the prettiest thing in the pool scene—plain at best, ugly at worst. Even aside from the mediocre appearance, the white shows dirt quickly. Because these steps jut out from the pool, you have to customize the pool cover to fit over them. 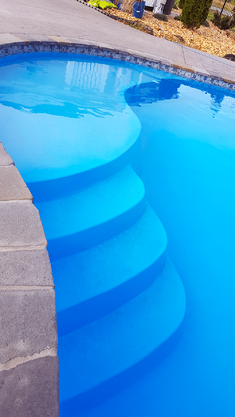 Algae can grow in the edges where the liner meets the steps because water doesn’t circulate well there. Vinyl over steps are a set of prefabricated steps that you install when you’re assembling the wall panels. They come in multiple shapes and materials. You order the liner to fit over the steps. Vinyl over steps are more attractive than white plastic. You also have more options—you can choose where you want them (along a wall, in a corner, etc. ), how they look (linear or rounded), and what material they’re made of (metal or polymer). As you might expect, vinyl over steps are more expensive than plain plastic steps. This includes both the initial cost and the lifetime cost of liner repairs and replacements. You’ll have to keep a close eye out for punctures and tears on the steps. This can happen simply from the extra wear and tear, but there’s extra concern about dog claws if your pet plays there. A pool ladder is just stainless-steel rails with rungs that come down over the side of the pool. It’s installed into the patio, not the pool, and can be removed. 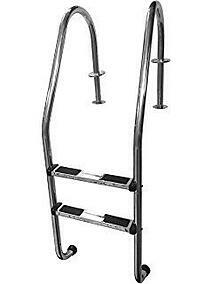 A basic pool ladder is less expensive. You can remove the ladder if you want to. For instance, in the off season, you can remove it and then pull out the cover pool. That way the pool cover doesn’t have to be customized to go around it, which you have to do with white plastic pool steps. Because a ladder is removable and simple, you can easily replace it when it wears out. A ladder is harder to use getting in and out of the pool. It can be especially difficult for people who aren’t as strong, mobile, or agile. If older people will be using the pool, normal steps may be a better option. 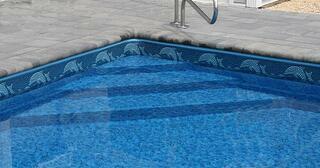 If none of these three options appeal to you, then you should consider a fiberglass pool. As you can see in our designs, each one comes with steps and bench seats integrated into the pool shell. They’re beautiful and extremely durable. 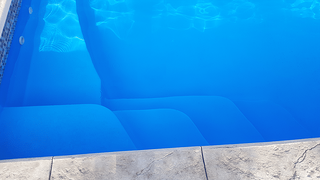 The steps never need to be replaced, and neither does the pool’s interior finish if done correctly (unlike a vinyl liner, which only lasts 5-9 years). River Pools is located in Virginia and manufactures fiberglass pools that are distributed throughout North America. If you would like to find a dealer, or if you live in Virginia or Maryland and would like to talk to us about fiberglass pools, we’d love to hear from you. Editor's note: This blog article was updated on October 17, 2018.